Donald Trump wants to rebuild America’s infrastructure the same way he built his buildings: debt, debt and more debt. His then-economic adviser, Gary Cohn, learned this the hard way in a fraught meeting last year, the details of which haven’t been previously reported. What happened: As Cohn and his team were putting together their $1.5 trillion infrastructure package, Cohn tried to use a real estate analogy to sell Trump on his plan to pair public and private investment. It backfired. The Cohn plan proposed leveraging $200 billion of federal investment into a $1.5 trillion overall infrastructure package — with state and local governments and the private sector making up the difference. Trump was skeptical. Instead, he just wanted the federal government to borrow tons of money for infrastructure projects. He was especially obsessed with overhauling his hometown airport LaGuardia, which he calls "Third World." The President horrified some Republicans in an October 2017 meeting with members of Congress at the White House when he told the Democrats that he liked their plan of massive public investment in infrastructure, according to a source in the room. "We've just gotta spend money on this," Trump said, according to the source. "He wants to govern like Robert Moses, but Republicans won't let him," the source added, referring to the titanic public official known as the "master builder" of mid-20th century New York City. In a separate conversation, Cohn tried to win Trump over with a real estate analogy, according to two sources familiar with their conversation. "Think about when you're putting up a building, you put down $50 million of your own money to leverage several hundred million," Cohn told Trump. The president scoffed. He told Cohn that when he was building, he'd never be so stupid as to put down his own money. He'd borrow the first installment from one bank and borrow the rest from another bank. Cohn told associates afterwards that he'd never have supported such an idea when he worked at Goldman Sachs. "I'm a 30% equity guy," Cohn told associates after the conversation. "He [Trump] is 100% leverage." Why this matters: During his career as a real estate magnate, Trump proudly called himself the "King of Debt." Now, he's the President of Debt — stimulating the economy by slashing taxes and jacking up defense spending without doing anything serious to rein in entitlement spending. A source familiar with Trump's private conversations with Republican members tells me it's going too far to say he doesn't care at all about debt. "When he talks to [Rep. Mark] Meadows and Freedom Caucus members, he's very sensitive to the sense that we're accumulating as much debt as the Obama years," the source said. 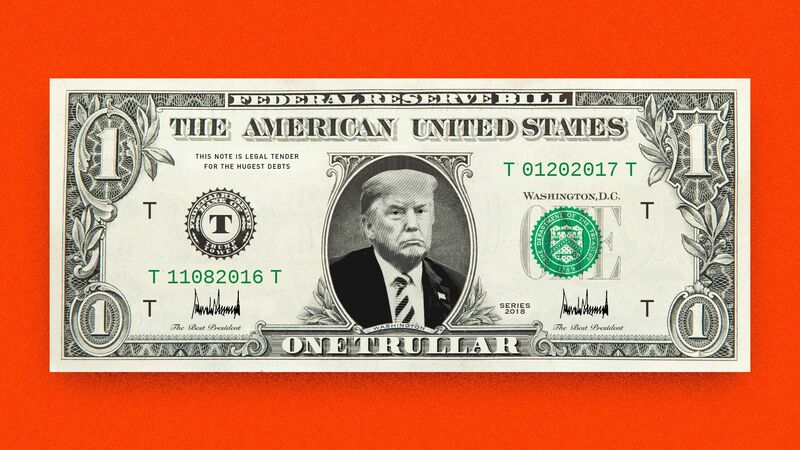 But the proof is in the numbers: Under Trump, the U.S national debt has passed the $21 trillion mark. What's next? Senior administration officials tell me Trump is still dead keen on passing a massive infrastructure bill. He likes the sound of big round numbers: A $1 trillion package is music to his ears. If Democrats win the House in November, it's more than possible Trump will defy his own party and favor Sen. Elizabeth Warren's approach of heavy federal borrowing over private investment.